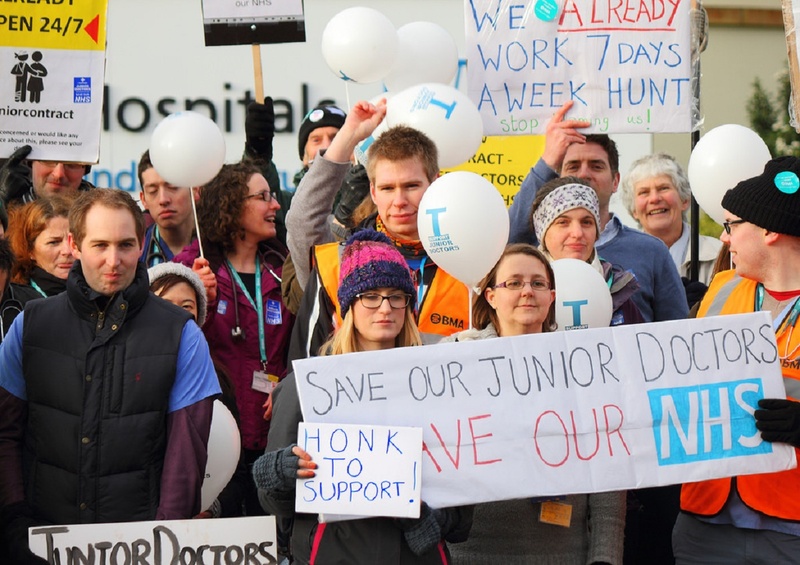 This week the BMA announced a series of junior doctors’ strikes on a much bigger scale than we have seen so far during the dispute. This time there will be five consecutive days of all out strikes from 8am to 5pm starting on September 12th. This will then be followed by similar five day strikes in October, November and December. The impact of these strikes on patient care will be enormous. Junior doctors have assured the public that emergency care will continue to be covered, but the implication that this means patients will be fine is absolutely wrong. As a result of the strike all elective surgery will be cancelled. ‘Elective’ means ‘non-emergency’, but that doesn’t mean the surgery is unimportant. As consultants move to cover junior doctors’ roles in wards and in A&E their out-patient clinics will be cancelled. And capacity for the many tests that are overseen by doctors will be massively reduced – some aspects of radiology and pathology, as well as tests and investigations done under anaesthetic. It can be difficult to fully appreciate the impact these cancellations will have on individuals. But imagine you are an elderly person suffering in tremendous pain while you wait for a hip replacement – if it is scheduled during strikes, it will be cancelled. Or imagine you have a heart problem and are waiting for an angiogram; or a cancer patient waiting for an MRI scan to see if your cancer has spread; or someone with a suspicious lump who is waiting to see a doctor in an out-patient clinic. Hundreds of thousands of these kinds of procedures, tests and appointments will be cancelled for every week of the strike. For some patients, it won’t matter too much: a longer wait will be annoying, but have no real impact on their health. For others, it will mean extra weeks of suffering in pain. And for a minority of patients affected, they will die; the delay to their appointment, test or treatment – or all three, if the strike holds for four months – will mean their life is lost. But it doesn’t stop there – it isn’t just the people who are unlucky enough to have appointments scheduled for strike weeks that will be affected. All aspects of NHS services are running at full capacity, and that means catching up will be very difficult. One NHS management source tells me that it could easily take 12 or 18 months to catch up with the extra backlog these four strikes will create. For some Trusts which are already behind, it could take even longer. This means that the quality of care, quality of life, and in some cases prospects for survival of patients in England will be affected for a long time after the strike is over. It seems obvious that one way to mitigate these effects is to prioritise which patients are seen – moving more routine, less life threatening cases to the bottom of the waiting list and prioritising the most in need. Unfortunately, many NHS Trusts in England do not have the capacity to do that and are not able to look at their appointments pipeline, filter and set priorities. And even in the minority of Trusts are able to do that, it isn’t always clear from a GP referral which patients are most at risk. It’s not just about delays: for the people who receive emergency care during the strikes, it may not be of the highest quality. Senior doctors will be moved to fill the posts of their juniors, but because the ratio of senior doctors to junior doctors varies by speciality, not all senior doctors will be working in an area they are familiar with. Administrators will, of course, try to match skills & experience with posts as far as is possible, but workforce realities mean that will not always be possible. That problem is, of course, compounded by how short the notice is for the first strike. Most NHS Trusts have contingency plans in place for one or two day strikes – very few have any plans for repeated five day strikes. Less than two weeks is not enough time to do the planning that is required, including allocating senior doctors to fill in posts that best match their skills and experience. As many people know, the NHS experiences massive additional pressures during the winter. People – especially older people – are much more likely to be ill. The pressure on emergency care is greater as viruses and infections (like flu) spread and hit vulnerable people more. In cold snaps, older people are more likely to have falls and sustain injuries – many of which require in-patient care and surgery. What many people do not know is that the ‘winter pressures’ period begins at the beginning of October. In the past, peaks in illness and pressure on the NHS have happened in November and December, and in many hospitals cold snaps even when at full capacity mean elective surgery is cancelled and extra trauma/orthopaedic surgery lists are put on. If we have a cold snap that coincides with a strike – and the strike holds – people will die. There will simply not be enough senior doctors to cover emergency care and surgery. But again, the impact goes beyond the strikes themselves. Hospital administrators were engaged in winter pressure planning and ideally would continue adapting plans as the season develops. They have now been diverted to planning for the strikes, and with time being so scarce and pressures so high, it is unlikely that they will fully recover their winter pressures planning. That the BMA plans to put patients at risk to advance their cause in an industrial dispute is despicable. My hope is that individual doctors – who know what this strike will do – will consult their consciences and not walk out. And by my reckoning the irony here is that the Jnr Drs, who believe they are on a crusade to try to save the NHS from the Tories, whom they consider are hell bent on destroying it, may well end up being the ones who catalyse its downfall…and probably alienating the public too because of their threat of prolonged strike action.